Continuing the series 'Bach's Contemporaries', this volume concentrates on the wonderful music of Johann Schelle—a cousin of Kuhnau (another composer featured in this series). This immensely striking sacred music by Schelle (one of Bach's predecessors in the post of Kantor in Leipzig's famous Thomas Church) brings together a top-flight group of soloists and a large and colourful assembly of instrumentalists, and presents remarkable and splendidly varied music which not only stands up proudly in its own musical right, but also greatly enhances our understanding of Bach's own sacred writing. In the learned and very eloquent obituary for his predecessor and cousin Johann Schelle, the Leipzig Thomaskantor Johann Kuhnau writes that the former rarely ‘brought forth a church composition or any other piece’ which did not meet with general appreciation. For this reason, Kuhnau writes, Schelle’s works would ‘be kept for a long time as documents and certificates of his wonderful gifts in the understanding of composition’ and let ‘the laudable sound of his glory never leave our ears’. As touching and confident as these prophecies are, they only partly came true. In July 1712 the Leipzig town council bought the musical legacy from Schelle’s widow for the choir of the Thomaskirche; however, already in the inventory of the Thomasschule (which was drawn up once a year) of 1723, it is stated that these manuscripts ‘have been damaged by their use and have become nearly unusable’. From 1731 the entry ‘Schelle’s Musical Things’ is missing completely; they had become wastepaper and nobody had thought it necessary to preserve the compositions by copying them. The destruction of old music corresponded to the changeable music taste of the time, which was in accordance with the newest compositions. Johann Sebastian Bach’s rather disparaging remark about his predecessors’ music performances also fits into this context; in his eyes ‘the present status musices is very different than that of former days’ and ‘art has risen considerably’; ‘the gusto has changed astonishingly’, which is why ‘the former kind of music will not please our ears anymore.’ Luckily, Schelle’s compositions were widely spread in all of Middle and Northern Germany; not everywhere were the old scores just thrown away as a result of faded interest in music from the late seventeenth century. About sixty of Schelle’s cantatas have survived to the present day—a stock which allows us to comprehend the enthusiastic judgements of his contemporaries. Schelle’s fruitful musical career was encouraged by the early discovery of his extraordinary gifts and a careful education. Born in 1648 in the village of Geising in the Erzgebirge as a son of a Kantor, he entered the electoral chapel in Dresden—then directed by Heinrich Schütz—at the age of only seven. When his voice broke, the sixteen-year-old changed to the alumnate of the Thomasschule with a reference from Schütz, before he was able to register at the Leipzig University three years later. His main interest, however, remained in music, which he studied diligently under the Thomaskantor at that time, Sebastian Knüpfer. He soon began to earn his living as a music teacher to aristocratic families. The growing reputation of the young musician led him to be entrusted with the post of Kantor in the nearby Eilenburg in 1670, at the age of twenty-two. After the death of his teacher Knüpfer in 1676 he applied for the succession of his post and was chosen out of a sizeable group of applicants by the Leipzig town council. He occupied this position—esteemed in every respect as a composer, organiser and teacher—for nearly a quarter of a century until his death on 10 March 1701. Schelle’s cantata performances on Sundays in the two main churches of Leipzig, St Thomas and St Nicolai, were widely known. During the last two decades of the seventeenth century hardly any visitor to Leipzig who was interested in music would have missed these performances. One contemporary witness reports that listeners ‘flew in like bees’ for the ‘sweet honey’ of Schelle’s church music. What was presented to the audience was a new style—a sweet and delightful sound, combined with carefully chosen texts and performed with a well-developed sense for big effects and refinement. Schelle knew how to compel the attention of laymen as well as experts, and the fascination that his compositions had then is still alive today. The success of Schelle’s compositions came from his turning away from the strict polyphony of his predecessors and approaching the light and agile style which was cultivated at the Dresden court by the two Kapellmeister Vicenzo Albrici and Marco Peranda, and which increasingly gained influence towards the end of the seventeenth century in Middle Germany. In his works, Schelle emphasizes melodic qualities and simple and easily comprehensible structures that can be perceived even in large-scale and multiple-part compositions. This becomes evident in the imposing twenty-five-part setting of the first five verses of Psalm 103, Lobe den Herrn, meine Seele (‘Praise the Lord, my soul’). The glory of the musical setting indicates a special occasion. As the work is already mentioned in a music inventory from 1688, it was probably composed in the first decade of Schelle’s tenure as Thomaskantor. One event during this time was the thanksgiving on 16 September 1683, for victory over the Turkish army, which had besieged the imperial capital of Vienna for nine weeks. The Saxon electoral prince Johann Georg III had been involved in the liberation and had ordered a national celebration for his return to Dresden. One Leipzig chronicle reports that during the celebratory service in St Thomas, after the solemn official sermon, ‘a beautiful music’ was played—maybe this setting of the Psalm by Schelle. The alternating tutti and solo sections display a similarity with the Venetian Psalm settings of Johann Rosenmüller. Towards the end of the piece the first verse is repeated textually and musically, thereby creating a formal rounding off before the work closes with a concise Alleluia-fugue. A very different facet of Schelle’s art appears in the Psalm setting Wohl dem, der den Herren fürchtet (‘He shall be blessed who fears God’). The work, which is scored for one voice and five-part instrumental ensemble, stands in the tradition of solo Psalm arrangements which had been established by Schelle’s teacher Heinrich Schütz and cultivated in Leipzig amongst others by Rosenmüller and Johann Theile. This work appears to be a very early composition of Schelle’s, also borne out by the many sections of the piece and the entry of—which later are far less drastic—‘madrigalistic’ text interpretations, for example at the word ‘Finsternis’ (‘darkness’), ‘barmherzig’ (‘merciful’) and ‘den Armen’ (‘the poor’). In his cantatas Schelle paid particular attention to excellent text models. He set to music at least twice a collection of cantata texts for one year (by David Elias Heidenreich, the Halle court poet), which was very famous in its time and used by many composers—one setting was in the form of a small-scale solo-cantata with only one voice and an instrumental accompaniment consisting of merely two violins and basso continuo; the other was a cycle of larger-scored works with three to six voices and a full instrumental ensemble. There are good reasons to assume that the small-scale set was composed during the Eilenburg period, and the large-scale one during the early Leipzig years. The two cantatas Herr, lehre uns bedenken and Gott, sende dein Licht originate from the Leipzig cycle. Following Italian models, Heidenreich’s libretti consist of a biblical quotation, which is played by the full forces at the beginning and end of the composition, and a poem of several stanzas, which is placed in the centre of the work and which comments poetically on the framing text. The musical form that developed from this type of libretto is called concerto-aria-cantata. Another mourning motet by Schelle is the large-scale double-choir setting of Christus ist des Gesetzes Ende (‘Christ is the law’s end’). The work was written for the funeral of the Leipzig citizen Gottfried Egger on 13 July 1684. The composition stands in the tradition of the Middle German motet as it was cultivated, amongst others, by Schelle’s teacher Heinrich Schütz and his predecessors Hermann Schein and Tobias Michael. The two large chorale cantatas Christus, der ist mein Leben and Vom Himmel kam der Engel Schar originate from a set for a year composed in 1688/89, which exclusively consisted of Hymn adaptations of this type. This was stimulated by the Pastor of the Thomaskirche, Johann Benedikt Carpzow. In his sermons he had, as he reports himself, ‘always explained a good, beautiful, old, Protestant and Lutheran Hymn, and also made the order for the congregation to sing this Hymn straight after the sermon has ended’. Schelle had agreed to ‘bring every Hymn into a gracious music, and let it be heard before the sermon’. Similarly structured is the Christmas cantata Vom Himmel kam der Engel Schar (‘From heaven came a throng of angels’), which opposes three instrumental choirs (trumpets and timpani, cornets and trombones, strings) to a five-part vocal choir. All six sections of this work develop the melody of the famous Lutheran Hymn with changing techniques. 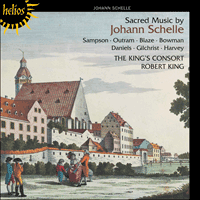 By shaping verses I and VI, and II and V almost identically, Schelle achieves a symmetrical framework, at whose centre, with verses III and IV, an elated, danceable version of the chorale appears, as well as a monumental cantus firmus arrangement. Corresponding with his artistic ambitions for this piece, Schelle employs elaborate composing techniques so that, again, this work not only appears easily comprehensible, but at the same time displays great glory and naturalness. Dans la nécrologie d’une grande érudition et d’une éloquence remarquable qu’il consacra à son prédécesseur et cousin, Johann Schelle, le cantor de l’église Saint-Thomas de Leipzig, Johann Kuhnau soulignait que celui-ci apportait rarement «une pièce pour l’église ou autre de sa composition» qui ne rencontrât l’approbation générale. Pour cette raison, écrivait Kuhnau, l’œuvre de Schelle serait «préservée pendant longtemps comme document et attestation de ses merveilleux talents dans l’entendement de la composition» et «jamais le son louable de sa gloire ne quitterait nos oreilles». Aussi touchantes et confiantes que ses prophéties puissent être, elles ne sont qu’en partie véridiques. En juillet 1712, le conseil municipal de Leipzig acheta à la veuve de Schelle le fonds musical de son défunt époux pour le chœur de Saint-Thomas; pourtant, dès l’inventaire de 1723—l’école en dressait un chaque année—il est indiqué que ces manuscrits «ont été endommagés par leur usage constant et sont devenus pratiquement inutilisables». À partir de 1731, la référence aux «Choses musicales de Schelle» a complètement disparu. Personne n’avait songé à recopier ces compositions, devenues aussi superflues que du vieux papier usagé, afin de les préserver. La destruction du matériau musical passé correspondait au changement de goût musical de l’époque lequel s’accordait immanquablement aux dernières compositions du jour. Les remarques désobligeantes de Jean Sébastien Bach à propos de l’exécution de la musique de ses prédécesseurs se situent également dans ce contexte. À ses yeux, «l’actuel status musices diffère largement de celui d’antan» et «l’art s’est considérablement élevé»; «le gusto a étonnamment changé», et c’est pourquoi «la manière ancienne de composer ne satisfait plus nos oreilles.» Fort heureusement, les compositions de Schelle étaient largement diffusées dans toute l’Allemagne centrale et nordique; et il est des lieux qui ne se débarrassèrent point des vieilles partitions une fois révolu l’intérêt pour la musique de la fin du XVIIe siècle. Une soixantaine des cantates de Schelle a survécu—un corpus qui nous permet d’apprécier les jugements enthousiastes de ses contemporains. La carrière musicale fructueuse de Schelle fut favorisée par la découverte précoce de ses dons extraordinaires et secondée par une éducation soignée. Né en 1648 dans le village de Geising, dans le Erzgebirge, ce fils d’un maître de chapelle entra lui-même à la chapelle électorale de Dresde—alors dirigée par Heinrich Schütz—à l’âge de sept ans. À la mue, le jeune garçon de seize ans rejoignit l’alumnat de l’école Saint-Thomas grâce à une recommandation de Schütz, avant de s’inscrire à l’Université de Leipzig trois ans plus tard. Son intérêt principal demeurait pourtant la musique qu’il étudia avec diligence sous la direction du cantor de l’époque, Sebastian Knüpfer. Il commença rapidement à gagner sa vie comme professeur de musique auprès de l’aristocratie. Jouissant d’une renommée croissante, le jeune homme se vit confier le poste de cantor dans la ville voisine d’Eilenburg en 1670, à l’âge de vingt-deux ans. À la mort de son professeur, Knüpfer, en 1676, il brigua sa succession et fut choisi parmi un large nombre de postulants par la municipalité de Leipzig. Il demeura à ce poste—estimé de tous comme compositeur, organiste et enseignant—durant pratiquement un quart de siècle, jusqu’à sa mort, le 10 mars 1701. Exécutées les dimanches à Saint-Thomas et Saint-Nicolas, les deux églises les plus importantes de Leipzig, les cantates de Schelle étaient connues d’un public nombreux. Au cours des deux dernières décennies du XVIIe siècle, il n’est pas un visiteur de Leipzig nourrissant un certain intérêt pour la musique qui aurait manqué d’assister à ces exécutions. Un témoin de l’époque rapporte que les auditeurs «se pressaient comme des abeilles» autour du «doux miel» afin d’entendre la musique sacrée de Schelle. C’est que le public venait y découvrir un style nouveau—une sonorité douce et délicieuse associée à des textes soigneusement choisis et une exécution polie secondée par un sens poussé des grands effets et des superbes raffinements sonores. Au même titre que les plus experts, Schelle disposait de cet intime secret: il savait fixer et retenir l’attention du grand public. La fascination que ses compositions exerçaient alors est toujours bien vivante de nos jours. Leur succès est dû à son éloignement de la stricte polyphonie de ses prédécesseurs et à son aspiration à un style léger et agile cultivé à la cour de Dresde par deux maîtres de chapelle, Vicenzo Albrici et Marco Peranda, un style qui exerça une influence de plus en plus grande en Allemagne centrale à la fin du XVIIe siècle. Dans son œuvre, Schelle privilégie les qualités mélodiques, les structures simples et aisément perceptibles même dans des compositions à plusieurs parties de grande envergure. Lobe den Herrn, meine Seele («Loue le Seigneur, mon âme»), une œuvre imposante à 25 voix sur les cinq premiers versets du Psaume 103, en est une illustration probante. La nature glorieuse et solennelle de la musique est certainement le signe d’un événement particulier. Étant donné qu’elle est répertoriée dans l’inventaire de 1688, elle a probablement été composée durant les dix premières années de son poste de cantor à l’église Saint-Thomas. Un des événements marquants de cette période se déroula le 16 septembre 1683 quand une action de grâces fut rendue pour la victoire sur l’armée turque qui avait assiégé Vienne pendant neuf semaines. Le Prince électeur de Saxe, Johann Georg III avait pris part à la libération de la capitale impériale et avait pour son retour à Dresde ordonné à tous une fête nationale. Un chroniqueur leipzigois rapporte que durant le service commémoratif de Saint-Thomas, après la solennité du sermon officiel, on joua «une musique d’une grande beauté»—peut-être le psaume de Schelle. Les sections tutti et solo alternent à la manière des psaumes vénitiens de Johann Rosenmüller. Peu avant la conclusion, le texte et la musique du premier verset sont repris, parachevant ainsi la forme avant que ne soit finalement entonné un alléluia-fugue concis. C’est une facette très différente de l’art de Schelle qui apparaît avec le psaume Wohl dem, der den Herren fürchtet («Béni soit celui qui craint le Seigneur»). Cette œuvre conçue pour voix seule et ensemble instrumental à cinq parties s’inscrit dans la tradition des arrangements des psaumes pour voix seule établie par le professeur de Schelle, Heinrich Schütz et cultivée à Leipzig entre autres par Rosenmüller et Johann Theile. Elle semble être une composition très ancienne de Schelle comme en témoignent les nombreuses sections et l’utilisation de maints «madrigalismes» illustrant musicalement le texte, par exemple sur les mots «Finsternis» («ténèbres»), «barmherzig» («charitable») et «den Armen» («le pauvre»), une technique dont il se servit de manière moins radicale par la suite. Dans ses cantates, Schelle accordait une attention particulière à l’excellence des textes. Un volume de textes de cantates pour l’année liturgique (de la plume de David Elias Heidenreich, poète à la cour de Halle) était alors très populaire. De nombreux compositeurs s’en servirent. Schelle le mit en musique à deux reprises au moins—une première fois sous la forme de cantates modestes pour voix seule et accompagnement instrumental de deux violons et basse continue essentiellement et la seconde sous la forme d’un cycle d’amples compositions conçues pour trois à six voix et un effectif instrumental complet. On a de bonnes raisons de croire que les œuvres de chambre furent écrites durant la période passée à Eilenburg tandis que celles plus importantes virent le jour à Leipzig. Les deux cantates Herr, lehre uns bedenken et Gott, sende dein Licht font partie du cycle leipzigois. Suivant les modèles italiens, les libretti de Heidenreich sont composés d’une citation biblique énoncée au début et à la fin de l’œuvre au tutti, et d’un poème de plusieurs strophes placé en son centre qui commente poétiquement la citation. La forme musicale engendrée par ce genre de livret est dénommée concerto-aria-cantate. Christus ist des Gesetzes Ende («Christ est la fin de la loi») est un autre motet de lamentation de Schelle, écrit pour les funérailles d’un habitant de Leipzig, Gottfried Egger, le 13 juillet 1684. Cette composition s’inscrit dans la tradition des motets de l’Allemagne centrale telle que Heinrich Schütz, le professeur de Schelle, et ses prédécesseurs Hermann Schein et Tobias Michael l’avait cultivée. Deux cantates chorales d’amples proportions Christus, der ist mein Leben et Vom Himmel kam der Engel Schar trouvent leurs origines dans un volume de la liturgie annuelle composé en 1688/89 et constitué exclusivement d’hymnes adaptés de la même manière. Le pasteur de l’église Saint-Thomas, Johann Benedikt Carpzow, en est à l’origine. Dans ses sermons, il avait, comme lui-même le souligne «toujours expliqué un hymne protestant ou luthérien, ancien, beau et bon et intimé à l’assemblée de le chanter immédiatement après la fin du sermon». Schelle avait accepté de «réaliser pour chaque hymne une musique gracieuse pour la faire entendre avant le sermon». Épousant une structure semblable, la cantate de Noël Vom Himmel kam der Engel Schar («Du Ciel vint une ribambelle d’anges») oppose les trois chœurs instrumentaux (trompettes et timbales, cornets à bouquin et trombones, cordes) au chœur vocal à cinq parties. Cette partition en six mouvements développe la mélodie du célèbre hymne luthérien avec des techniques variées. En modelant les versets I et VI, et II et V de manière pratiquement identique, Schelle parvint à ciseler un cadre symétrique avec en son centre les versets III et IV, une version dansante, transportée de joie apparaissant alors avec un arrangement monumental du cantus firmus. Répondant à ses ambitions artistiques, Schelle emploie des techniques de composition élaborées si bien que cette œuvre donne non seulement l’impression d’être aisément perceptible mais dévoile aussi une immense gloire empreinte de naturel. In dem gelehrten und überaus eloquenten Nachruf, den der Leipziger Thomaskantor Johann Kuhnau anläßlich der Beisetzung seines Amtsvorgängers und Vetters Johann Schelle verfaßte, heißt es, daß dieser selten „ein Kirchen- oder andres Stücke von seiner Composition herfür gebracht“ habe, das nicht allgemeine Zustimmung gefunden hätte. Aus diesem Grunde, so Kuhnau, würden Schelles Werke bei der Nachwelt „als zulängliche Uhrkunden und Zeugnisse seiner herrlichen Gaben des Verstandes in der Composition lange verwahret liegen“ und „der löbliche Klang seines Ruhms aus unsern Ohren zu keiner Zeit verschwinden“. So rührend und zuversichtlich diese Prophezeiungen sind—sie erfüllten sich nur zum Teil. Der Rat der Stadt Leipzig erwarb zwar im Juli 1712 für den Gebrauch der Thomaner von Schelles Witwe den musikalischen Nachlaß ihres Mannes, doch heißt es in dem jährlich erstellten Inventar der Thomasschule bereits 1723, daß diese Handschriften „vom Gebrauch ziemlich beschädiget und fast unbrauchbar worden“ seien. Von 1731 an fehlt der Posten „Schellens Musicalische Sachen“ völlig; sie waren Makulatur geworden, und niemand hatte es mehr für notwendig erachtet, die Kompositionen durch neue Abschriften zu bewahren. Die Vernichtung alter Musikalien entsprach dem stets auf die neuesten Kompositionen gerichteten wandelbaren Musikgeschmack jener Zeit. Hierzu paßt auch Johann Sebastian Bachs eher abfällige Beurteilung der Musikaufführungen seiner Vorgänger im Amt des Thomaskantorats; in seinen Augen war „der itzige status musices gantz anders weder ehedem beschaffen“ und „die Kunst um sehr viel gestiegen“, auch habe „der gusto sich verwunderenswürdig geändert“, weshalb „auch die ehemalige Arth von Music unseren Ohren nicht mehr klingen“ wollte. Glücklicherweise erfreuten sich Schelles Kompositionen aber einer weiten Verbreitung in ganz Mittel- und Norddeutschland, und nicht überall zog man aus dem geschwundenen Verständnis für die Musik des späten 17. Jahrhunderts die Konsequenz, die alten Partituren und Stimmen einfach wegzuwerfen. So sind heute immerhin noch etwa 60 Kantaten aus seiner Feder erhalten—ein Werkbestand, der uns in die Lage versetzt, die begeisterten Urteile seiner Zeitgenossen nachzuvollziehen. Schelles fruchtbare musikalische Laufbahn wurde durch die frühe Entdeckung seiner außergewöhnlichen Begabung und eine sorgfältige Ausbildung begünstigt. Im Jahre 1648 als Sohn eines Kantors in dem erzgebirgischen Dorf Geising geboren, fand er bereits im Alter von sieben Jahren Aufnahme in die—damals unter der Leitung von Heinrich Schütz stehende—kurfürstliche Kapelle in Dresden. Nach Eintritt des Stimmbruchs wechselte der damals Sechzehnjährige auf Empfehlung von Schütz ins Alumnat der Thomasschule, bis er sich drei Jahre später an der Leipziger Universität einschreiben konnte. Sein Hauptinteresse galt jedoch weiterhin der Musik, die er unter Anleitung des damaligen Thomaskantors Sebastian Knüpfer fleißig studierte; und schon bald fing er an, auch selbst in vornehmen Bürgerhäusern als Musiklehrer seinen Unterhalt zu verdienen. Die wachsende Reputation des jungen Musikers führte dazu, daß ihm bereits 1670, im Alter von 22 Jahren, das Stadtkantorat im nahegelegenen Eilenburg anvertraut wurde. Nach dem Tod seines Lehrmeisters Knüpfer im Jahre 1676 bewarb er sich um dessen Nachfolge und wurde vom Rat der Stadt Leipzig aus einer größeren Schar von Bewerbern ausgewählt. Diese Position bekleidete er—allseits als Komponist, Organisator und Lehrer geschätzt—beinahe ein Vierteljahrhundert lang bis zu seinem Tod am 10. März 1701. Schelles sonntägliche Kantatenaufführungen in den Leipziger Hauptkirchen St. Thomas und St. Nikolai waren weithin bekannt. In den letzten beiden Jahrzehnten des 17. Jahrhunderts dürfte wohl kaum ein musikinteressierter Besucher Leipzigs diese Darbietungen versäumt haben. In der Tat weiß man von einem Zeitzeugen, daß wegen des „süßen Honigs“ von Schelles Kirchenmusik die Zuhörer stets „herbeiflogen wie die Bienen“ zur Blüte. Denn was hier dem Publikum geboten wurde, war ein neuer Stil—dem Ohr lieblich und gefällig klingend, auf sorgfältig ausgesuchte Texte komponiert und vorgetragen mit einem gut entwickelten Sinn für große Wirkungskraft und Raffinesse. Schelle kannte das Geheimnis, sowohl Laien wie auch Kenner gleichermaßen zu fesseln. Und die Faszination, die damals von seinen Kompositionen ausging, ist auch heute noch lebendig. Der Erfolg von Schelles Kompositionen bestand in einer Abkehr von der strengen Polyphonie seiner Vorgänger und einer spürbaren Annäherung an den leichten und hellen Stil, der am Dresdner Hof durch die beiden Kapellmeister Vicenzo Albrici und Marco Peranda gepflegt wurde und der gegen Ende des 17. Jahrhunderts in ganz Mitteldeutschland zunehmend an Einfluß gewann. Schelle legte in seinen Werken ganz besonderen Wert auf melodische Qualitäten und eine schlichte und leicht faßliche Satztechnik, die selbst in großbesetzten, vielstimmigen Kompositionen zu spüren ist. Dies zeigt sich etwa in der imposanten 25stimmigen Vertonung der ersten fünf Verse von Psalm 103, Lobe den Herrn, meine Seele. Die Prächtigkeit der Besetzung läßt an einen besonderen Anlaß denken. Da das Werk bereits in einem Musikalieninventar von 1688 genannt ist, dürfte es im ersten Jahrzehnt von Schelles Leipziger Tätigkeit entstanden sein. Ein in diese Zeit fallendes Ereignis war das am 16. September 1683 gefeierte Dankfest anläßlich des Sieges über das türkische Heer, das die kaiserliche Residenzstadt Wien neun Wochen lang belagert hatte. An der Befreiung hatte sich auch der sächsische Kurfürst Johann Georg III. beteiligt, der bei seiner Rückkehr nach Dresden eine landesweite Feier anordnete. Eine Leipziger Chronik berichtet, daß anläßlich des Festgottesdienst in der Thomaskirche nach der feierlichen Amtspredigt „eine schöne Music“ erklang—möglicherweise also diese Psalmvertonung Schelles. Das Werk ähnelt in seinem Wechsel vollstimmiger und solistischer Abschnitte den venezianischen Psalmvertonungen Johann Rosenmüllers. Gegen Ende des Stücks wird der erste Vers textlich und musikalisch wieder aufgegriffen und schafft so eine sinnfällige formale Abrundung, bevor das Werk mit einer knappen Alleluia-Fuge schließt. Eine ganz andere Facette von Schelles Kunst zeigt sich in der Psalmvertonung Wohl dem, der den Herren fürchtet. Das mit nur einer Singstimme und fünfstimmigem Instrumentalensemble besetzte Werk steht in der Tradition der von Schelles Lehrer Heinrich Schütz begründeten solistischen Psalmbearbeitung, die in Leipzig unter anderem von Rosenmüller und Johann Theile gepflegt wurde. Es scheint sich bei diesem Werk um eine besonders frühe Komposition Schelles zu handeln. Hierfür spricht auch die Vielgliedrigkeit des Stücks und der Einsatz von—später nicht mehr in derselben Drastik zu findenden—„madrigalischen“ Textausdeutungen (etwa bei den Worten „Finsternis“, „barmherzig“ und „den Armen“). In seinen Kantaten legte Schelle offenbar ganz besonderen Wert auf exzellente Textvorlagen. Einen seinerzeit berühmten, von vielen Komponisten verwendeten Jahrgang von Kantatendichtungen des Halleschen Hofpoeten David Elias Heidenreich vertonte er mindestens zweimal—einmal in Form von kleindimensionierten Solokantaten mit nur einer Singstimme und einer lediglich aus zwei Violinen und Basso Continuo bestehenden Instrumentalbegleitung, und ein weiteres Mal als Zyklus von größer besetzten Werken mit drei bis sechs Singstimmen und einem vollstimmigen Instrumentalensemble. Es gibt gute Gründe anzunehmen, daß der kleinbesetzte Jahrgang während der Eilenburger Zeit und der großbesetzte in den frühen Leipziger Jahren entstand. Dem Leipziger Zyklus entstammen die beiden Kantaten Herr, lehre uns bedenken und Gott, sende dein Licht. Anknüpfend an italienische Vorbilder bestehen die Libretti Heidenreichs aus einem biblischen Spruch, der zu Beginn und am Ende der Komposition im vollen Tutti erklingt, und einer im Zentrum des Werks stehenden mehrstrophigen Dichtung, die den Rahmentext poetisch kommentiert. Die aus diesem Librettotyp erwachsene musikalische Form wird als Concerto-Aria-Kantate bezeichnet. Eine weitere Trauermotette Schelles ist die großangelegte doppelchörige Vertonung von Christus ist des Gesetzes Ende. Das Werk entstand für das Begräbnis des Leipziger Bürgers Gottfried Egger am 13. Juli 1684. Die Komposition steht in der Tradition der mitteldeutschen Motette, wie sie unter anderem von Schelles Lehrer Heinrich Schütz und seinen Vorgängern Hermann Schein und Tobias Michael gepflegt wurde. Die beiden großen Choralkantaten Christus, der ist mein Leben und Vom Himmel kam der Engel Schar entstammen einem 1688/89 entstandenen Jahrgang, der ausschließlich aus Kirchenliedbearbeitungen dieser Art bestand. Die Anregung hierzu ging von dem Pastor der Thomaskirche Johann Benedikt Carpzow aus. Dieser hatte, wie er selbst berichtet, in seinen Predigten „jedesmal ein gut, schön, alt, evangelisches und lutherisches Lied … erkläret, auch die Verfügung getan, das erklärte Lied in öffentlicher Gemeine gleich nach geendeter Predigt anzustimmen“. Schelle hatte sich bereit erklärt, „jedwedes Lied in eine anmuthige Music zu bringen, und solche vor der Predigt … hören zu lassen“.